Satoshi Box Review – Trustworthy Bitcoin Marketplace? SatoshiBox.com is like a mystery box. You never know what you’re going to get until you open it. Applying a twist and turn to the traditional cryptocurrency investment venture, Satoshi Box is a service platform that connects sellers with buyers. As you will gather from our unbiased review, the community consensus regarding the Satoshi Box operation has reflected a status of one that is untrustworthy. Before you commit with any seller package, we urge you to read this composite publication in its entirety! Satoshi Box is an online marketplace that enables sellers, who believe they have content of value, to sell their content to buyers. Sellers who have seemingly valuable contributions are able to upload files to the Satoshi Box server where prospective buyers are able to speculate a general idea of their potential purchase. Directed towards the cryptocurrency ecosystem, most of the files that can found at SatoshiBox.com are Bitcoin related. Since all transactions are executed via Bitcoin transactions, prospective buyers should approach all their potential purchases with caution considering how BTC transactions are irreversible once sent. While Satoshi Box may condone the act of deceptive or malware uploads, no authoritative actions are pursued by this site to eliminate such risks while they also claim not to be responsible for any loss of funds endured. 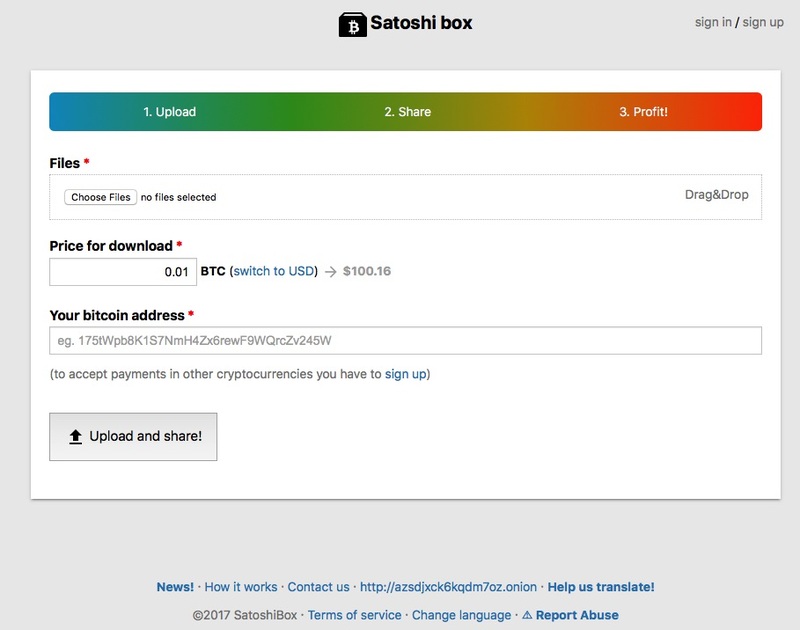 How does Satoshi Box Work? Speaking from an operational standpoint, Satoshi Box functions in a relatively straightforward manner. Sellers simply upload files to the server, specify their Bitcoin address and price then share the link to potential buyers. For each successful transaction that occurs, SatoshiBox receives a commission from the sellers profits ranging between 6% or 0.0015 BTC. In the eyes of the buyer, one browses the various seller packages offered through Satoshi Box. If that individual feels like the seller isn’t trying to screw them over and that the content available for purchase is legitimate, all they need to do is click the buy button where that individual will then be given a unique web address. This unique web address will allow the buyer to download the files they purchased through Satoshi Box, where he or she can then use the files to their disposal. The most dangerous element in regards to Satoshi Box would be the blatant lack of supervision. According to the SatoshiBox marketplace, most of the files that are uploaded are alleged Bitcoin generating programs. These programs, when downloaded, are supposed to help the buyer accrue Bitcoin earnings when in reality their software could be a complete fraud. Some reports of malware have also been reported by users who thought they were purchasing legitimate content but instead received something much more sinister. Satoshi Box has the potential to be a great marketplace but the lack of supervision regarding the type of files being uploaded is deeply troubling. Perhaps if Satoshi Box incorporated an escrow payment feature into their platform to protect their buyers then Satoshi Box could be considered as trustworthy. However, since no buyer safety features has been incorporated, we believe Satoshi Box cannot be trusted due to how easily sellers can manipulate buyers into purchasing their files. SatoshiBox.com possessed a SimilarWeb global rank of 116,276 on November 29th, 2017. Over 45% of the sites traffic is generated from social platforms where YouTube traffic accumulates for over 91% of all social traffic generated. SatoshiBox.com is a treatable cancer circulating through the cryptocurrency domain. If the admins behind the site would implement buyer rights and verify that each upload is authentic, then this Bitcoin marketplace could be a unique destination for cryptocurrency enthusiasts. Since all Bitcoin transactions are performed on a decentralized platform and irretrievable once sent, we implore all potential buyers to exercise caution before buying any file featured at Satoshi Box. Unfortunately, there is no way to tell whether or not the files uploaded are legitimate or possibly harmful to your processing unit until after you have spent your bitcoins. Our advice would be to avoid the Satoshi Box marketplace and utilize more trusted and effective routes to adding value to your Bitcoin arsenal. Review Verdict: Satoshi Box cannot be trusted! Have you been cheated by sellers at Satoshi Box? Please share any experience or feedback you may possess in a comment below! To learn about legitimate cryptocurrency investment opportunities visit our Cryptocurrencies Investment Guide! For those of you looking to stay ahead of the crypto curve, we encourage you to subscribe to ScamBitcoin.com. Members receive reviews and scam warnings directly to their inbox free of charge. i bought a file from satoshi box. Fine i got the download but the site was a fraud – simba premium satochi faucet. never recived payment from software. the software claims to collect satochi’s but never i never got the BTC.